Esher, July 2014. Equipped with Select operating technology, new shower solutions from bathroom specialist Hansgrohe offer the world of concealed installations more features, more design and convenient operation at the touch of a button. 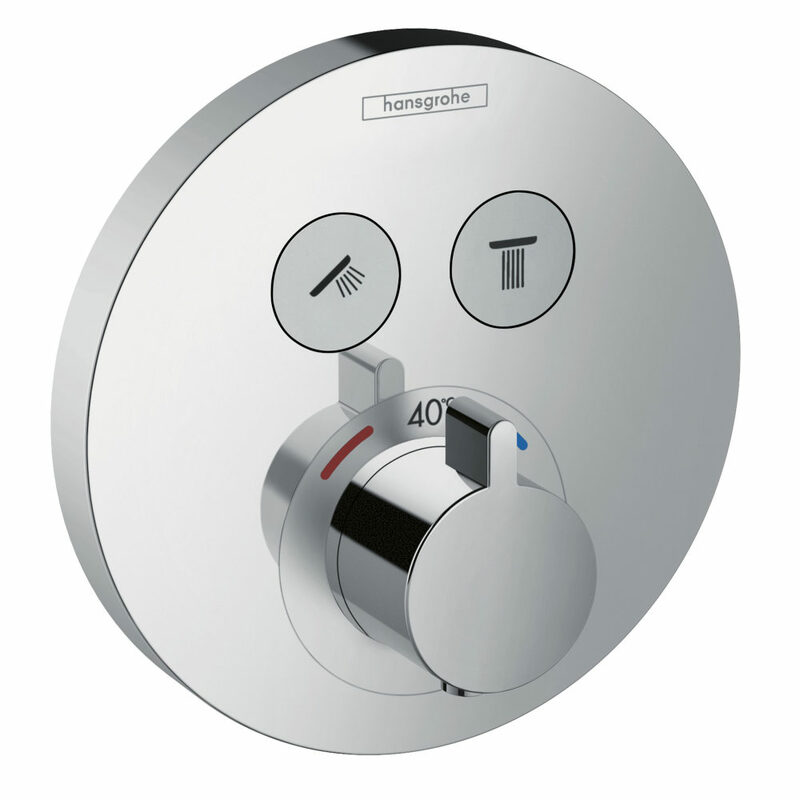 Available from June 2014, there is a new round S-design; ShowerSelect thermostat with integrated shower support, and new ShowerSelect manual mixers to complement the existing thermostatic options and meet the widest range of installation needs. New to the ShowerSelect Family In addition to the thermostats and new mixers with square wall plates, the new ShowerSelect S offers the choice of an alternative, attractive round design. Ideal for creating harmonious bathroom schemes, they are perfect for combining with round hand and overhead showers. Particularly ingenious is the new ShowerSelect thermostat with integrated Fixfit hose connection and shower support. Hose and shower can be selected to suit the user’s bathroom and requirements, and are easy to install: a smart solution for the shower. Its timeless, architectural form makes this thermostat the perfect choice for modern bathrooms, because it can be combined with lots of hand and overhead showers. The new ShowerSelect mixers are ideal for situations where a thermostatic solution is not required. They also come in the two design variants: with square or round wall plates. They are particularly suitable for use in locations where the water pressure in the pipes is stable guaranteeing uniform water temperature. Their intuitive operating concept is a key feature in all the ShowerSelect variants: the Select buttons and the ring with the eye-catching temperature display are given an elegant matt finish for better legibility of the symbols. The slender, flat handle enables the user to control the required temperature, with precision – even with soapy hands. The ergonomic and intuitive usability and easy-to-read symbols are ideal for older people, children and those with restricted mobility. There is also the option of installing the Select buttons in such a way that they are raised slightly so can be felt – features which qualify the ShowerSelect concealed installation solutions for use in bathrooms that require a high level of accessibility or in public shower facilities. The interaction with the iBox universal, makes installation of the ShowerSelect mixers and ShowerSelect thermostats, incredibly easy. The concealed installation unit is space-saving and creates a clean look, even for complex shower systems. They are also ideal for renovating existing bathrooms, which often have the iBox already installed. The ShowerSelect concept is based on an innovative shut-off valve, which enables the water flow to be controlled at the simple touch of a button, and no longer by rotating. There are no complex electronics, just a reliable mechanical control. The person showering can easily turn the water on and off or select the required jet type, all at the touch of a button. A concealed installation solution in the shower area has many advantages: the technology is hidden in the wall making the shower area look tidy and uncluttered, and allowing greater freedom of movement for the showerer.